A RECORD RAINFALL OF 1.86 INCH(ES) WAS SET AT SANTA MARIA AIRPORT CA TODAY. THIS BREAKS THE OLD RECORD OF 0.95 SET IN 1984. A RECORD RAINFALL OF 1.63 INCH(ES) WAS SET AT LOS ANGELES AIRPORT TODAY. THIS BREAKS THE OLD RECORD OF 1.62 SET IN 1984. 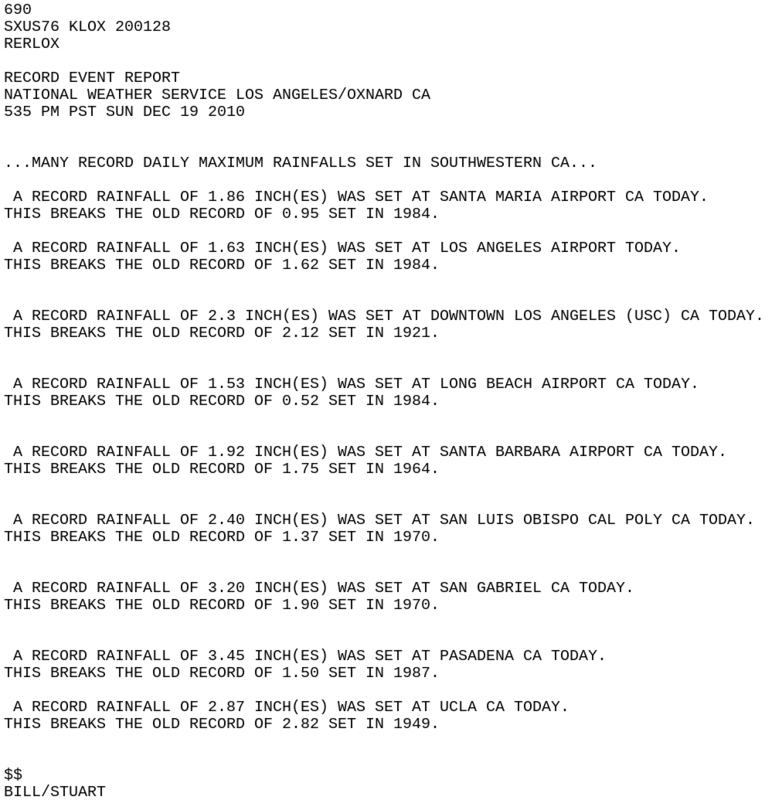 A RECORD RAINFALL OF 2.3 INCH(ES) WAS SET AT DOWNTOWN LOS ANGELES (USC) CA TODAY. THIS BREAKS THE OLD RECORD OF 2.12 SET IN 1921. A RECORD RAINFALL OF 1.53 INCH(ES) WAS SET AT LONG BEACH AIRPORT CA TODAY. THIS BREAKS THE OLD RECORD OF 0.52 SET IN 1984. A RECORD RAINFALL OF 1.92 INCH(ES) WAS SET AT SANTA BARBARA AIRPORT CA TODAY. THIS BREAKS THE OLD RECORD OF 1.75 SET IN 1964. A RECORD RAINFALL OF 2.40 INCH(ES) WAS SET AT SAN LUIS OBISPO CAL POLY CA TODAY. THIS BREAKS THE OLD RECORD OF 1.37 SET IN 1970. A RECORD RAINFALL OF 3.20 INCH(ES) WAS SET AT SAN GABRIEL CA TODAY. THIS BREAKS THE OLD RECORD OF 1.90 SET IN 1970. A RECORD RAINFALL OF 3.45 INCH(ES) WAS SET AT PASADENA CA TODAY. THIS BREAKS THE OLD RECORD OF 1.50 SET IN 1987. A RECORD RAINFALL OF 2.87 INCH(ES) WAS SET AT UCLA CA TODAY. THIS BREAKS THE OLD RECORD OF 2.82 SET IN 1949.